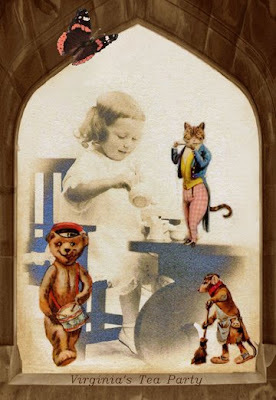 This week's Gothic Arches challenge is: "Toys - vintage or favorite from childhood." I've always loved this picture of my grandmother, Virginia (1913) . I wonder, what would it have been like to join Virginia for Tea? Catherine, your arch is gorgeous. I love the picture of your grandmother. Little girls used to play tea parties with their stuffed animals and dolls just as you have in your arch. Your picture is a treasure. What fun to have tea with those characters, Catherine, lovely arch especially featuring your Grandmother! Great arch, Catherine. I would like to join the little girl for tea! Beautiful and so personal too. I like the toys you've shown having the tea party with your Grandmother, Catherine! This looks great. So Adorable,your grandmother was a beautiful little girl! Such a fun arch - I love the old photo of your grandmother. How great to let your grandma play! I want a cat like that....wait, I think I do! Catherine ,Very sweet arch loved it very much,adorable! I love the little tea party. Such a fanciful arch. Wow! I love how you used a picture of your grandmother. That is incredible! Thank you so much for participating! I love this... it is beautiful!! !